Rod S, I wasn't referring to you specifically. I just appreciate well earned battle scars. I've been haunting the forum admiring all y'all's gear for long enough, so I figured I'd drop mine. 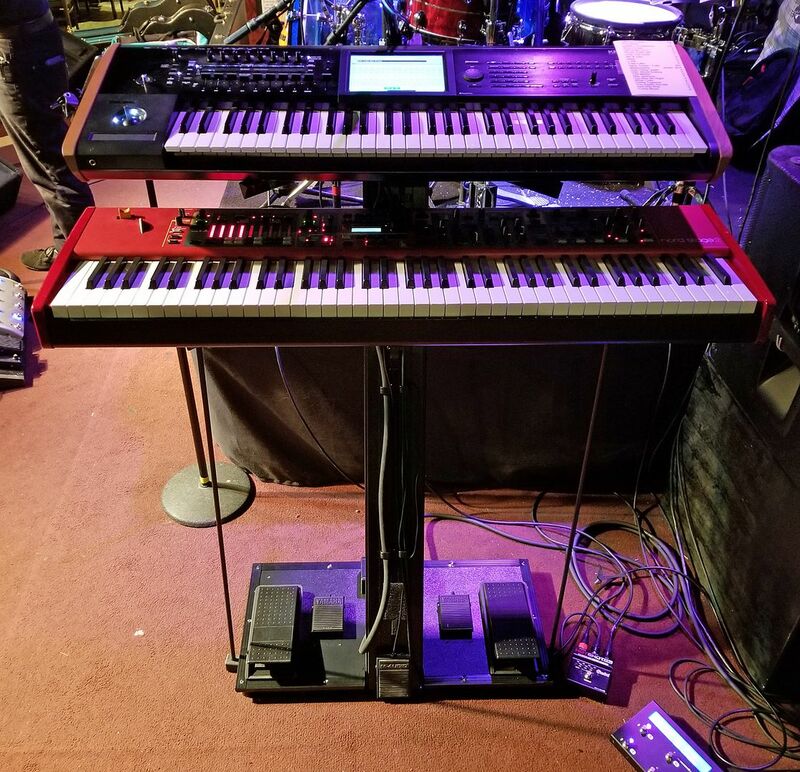 This is the biggest rig I haul around, for the seven-piece funk band I'm in. 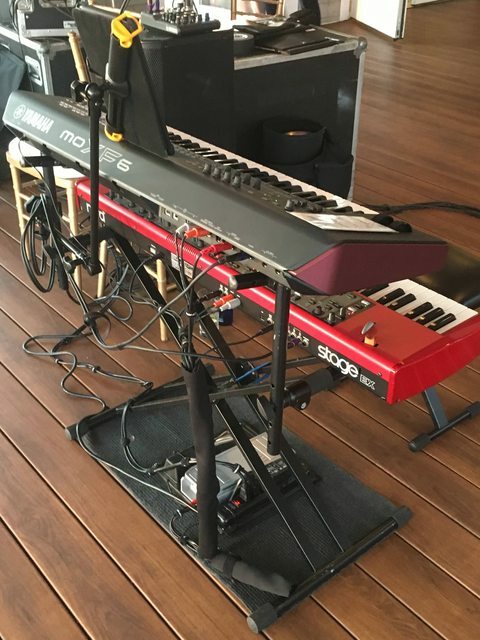 I use the Nord Electro 4D for organ 90% of the time, with the occasional Mellotron or chime samples. That goes through the rotary channel of the Motion Sound KBR-3D. The Novation Ultranova goes into the clean channel of the Motion Sound (or through the MXR talkbox). 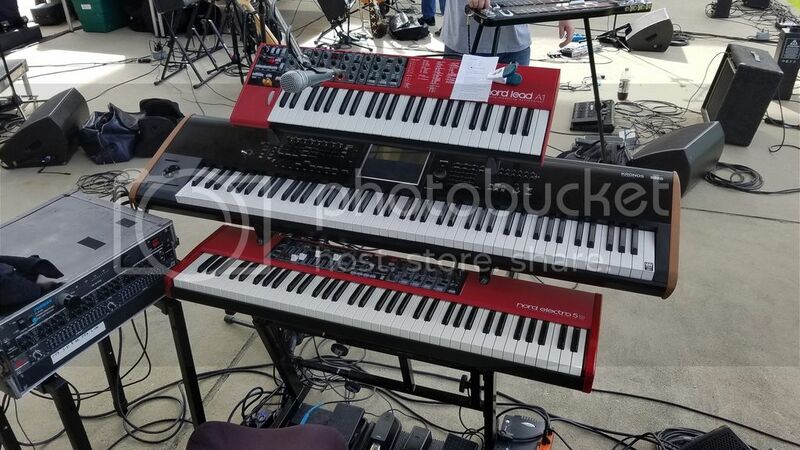 For smaller gigs, I'll use just the Nord and the Novation through the Motion Sound, and split the Nord's routing so I can send the organ to the rotary channel and everything else to the clean. It's a lot easier and faster to set up, but not nearly as fun to play. The clavinet has seen better days. What sounds do you use the Novation for? It seems out of place with all the classic keys. Keyboard fashion police, if the gear sounds good.. let it be. 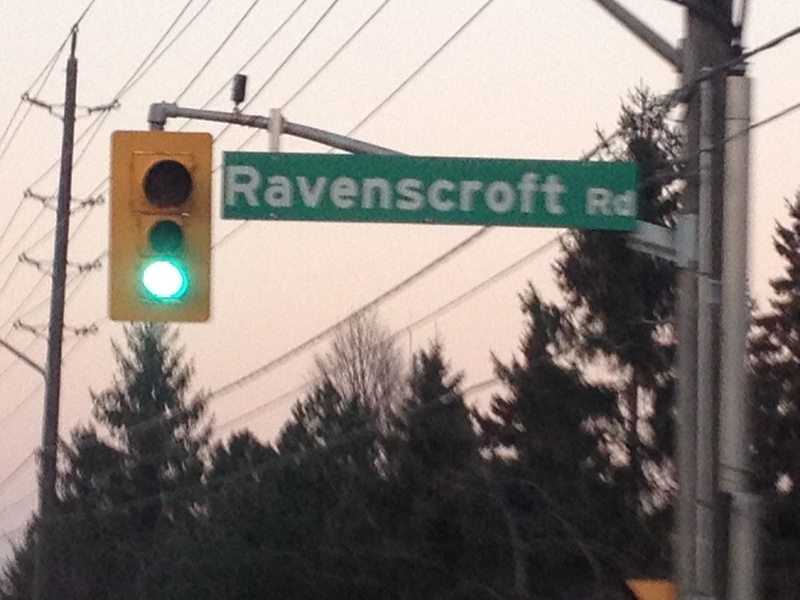 I know it sounds good - I own one. It is a heck of a VA at an excellent price point. It is just focused on very different sounds, and curious how it is used to complement the classic gear. It's all fine and dandy.. except that it really wasn't a question, it was more a statement. That's what I responded to. You made a comment about the Clavinet and that the Novation seems "out of place" with the rest of the gear. 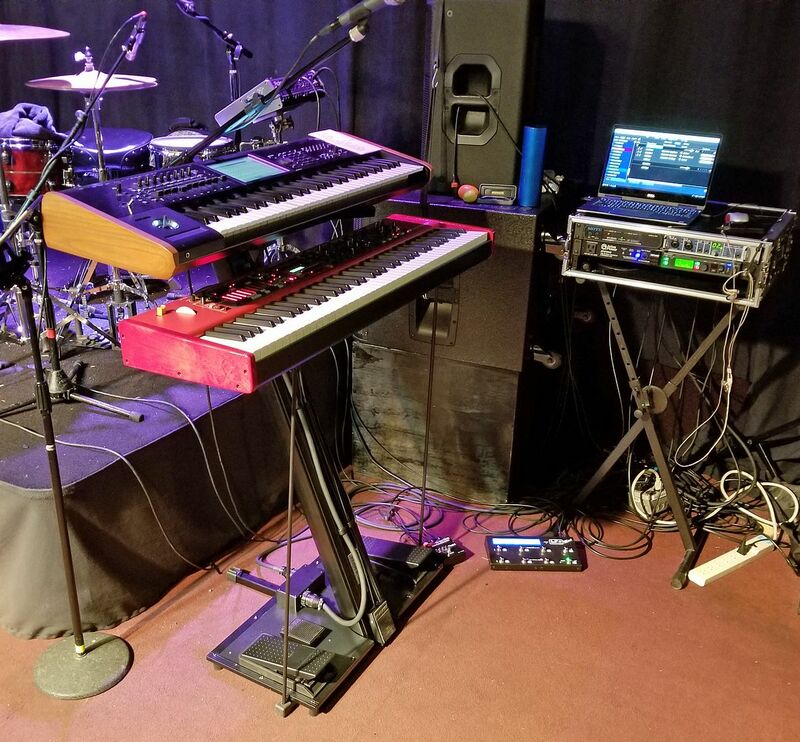 It's been a while for me but after doing the Mega-modular snake and pedal-board thing for eric, and getting tired of hauling around a fully assembled and non-collapsible frame-stand, I finally got around to redoing my live rig (again). First time live was last night. 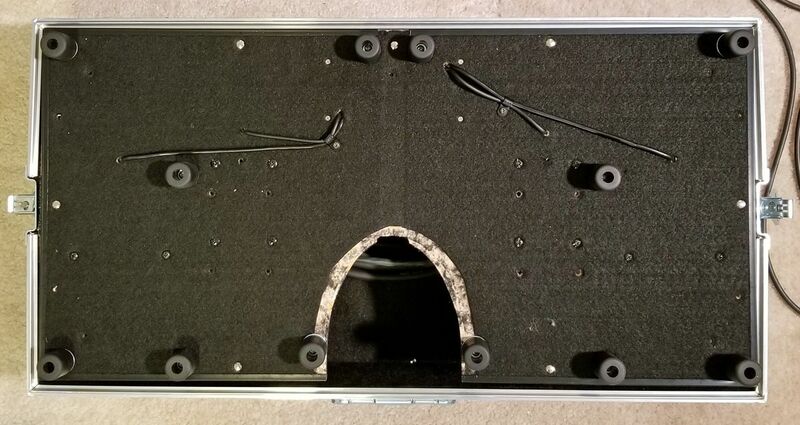 It's basically an Apex-48 pro with a USA Cases 12x24 guitar pedal-board. Both are heavily modified. The Apex was drilled out at the ends of the long support bars and side legs and 5/16" (8mm) steel rods were painted black and run between the legs and the support bars. This greatly improves the stability of the stand and is practically invisible under stage lighting. I got the idea from a band I saw a few weeks ago. 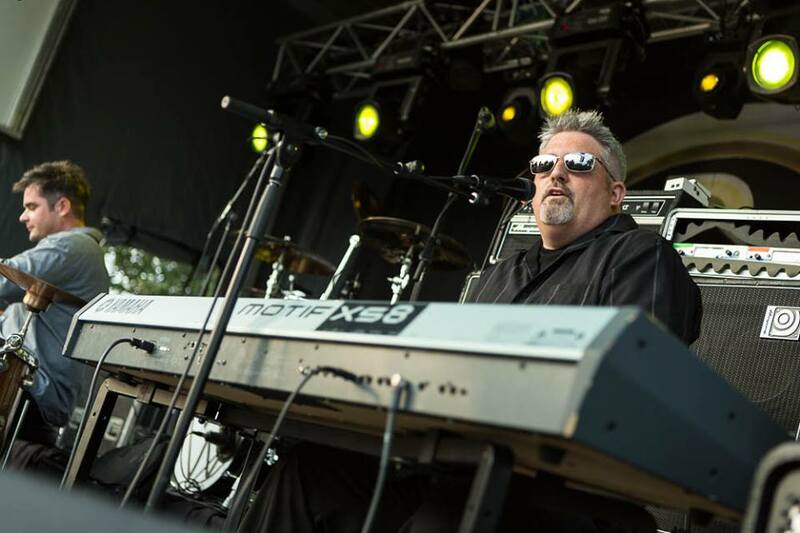 The keyboard player had wooden dowels painted black that served the same purpose. 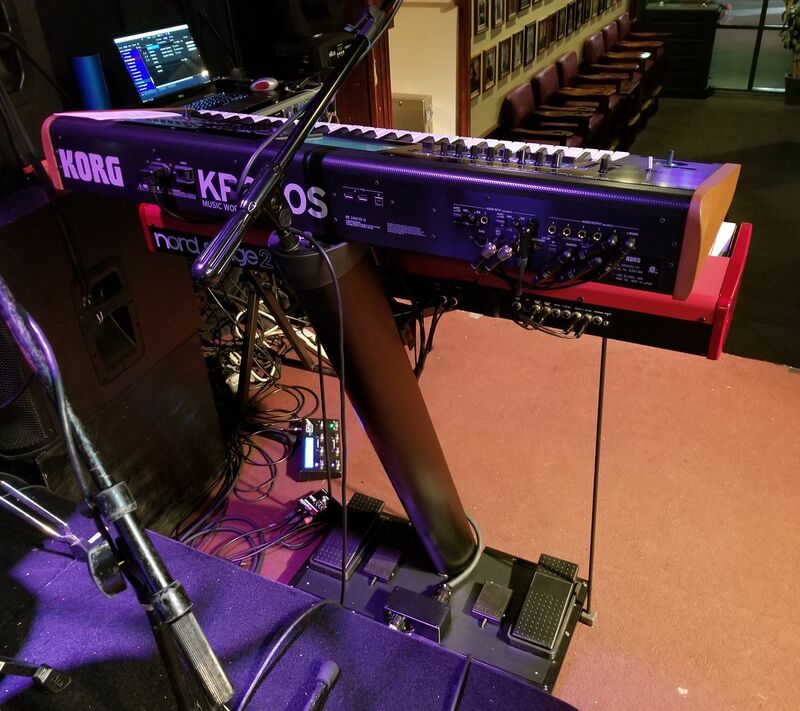 The undersides of both the NS2 and the Kronos have strategically placed small rubber feet that act as keys to lock the boards into position on the support bars and not let them move at all while on the stand. The rear of the Kronos is actually resting on the top of the column with the front on the support bars. Two small rubber feet were added to the underside of the Kronos near the rear center about 5" apart that sit down into the bar storage area at the top of the column and keep the Kronos from sliding forward. The lid that snaps closed over the bar storage area is left open and neither interferes with the Kronos positioning nor is visible in use. This also angles the Kronos to a very comfortable playing position. 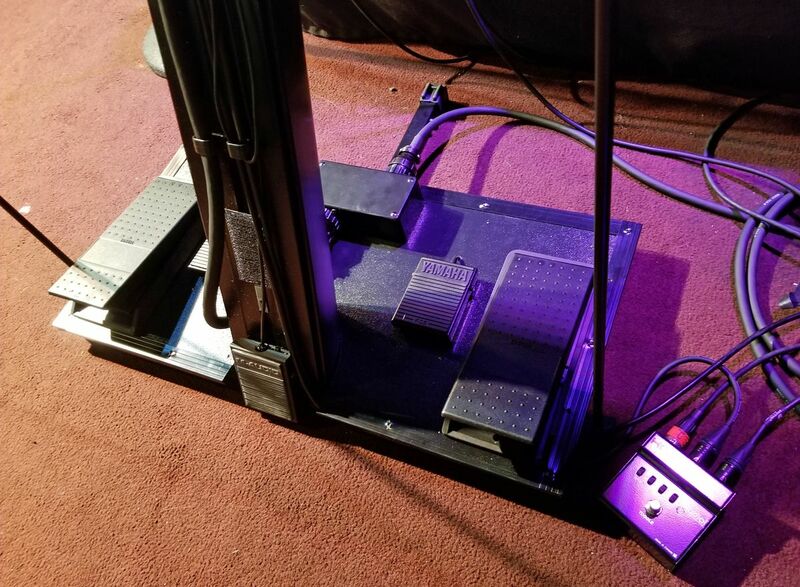 The pedal-board is actually upside-down from it's intended attitude, with the vinyl surface and split-rivets showing. A curved cutout was taken in the front center that matches the cross-section of the Apex column. 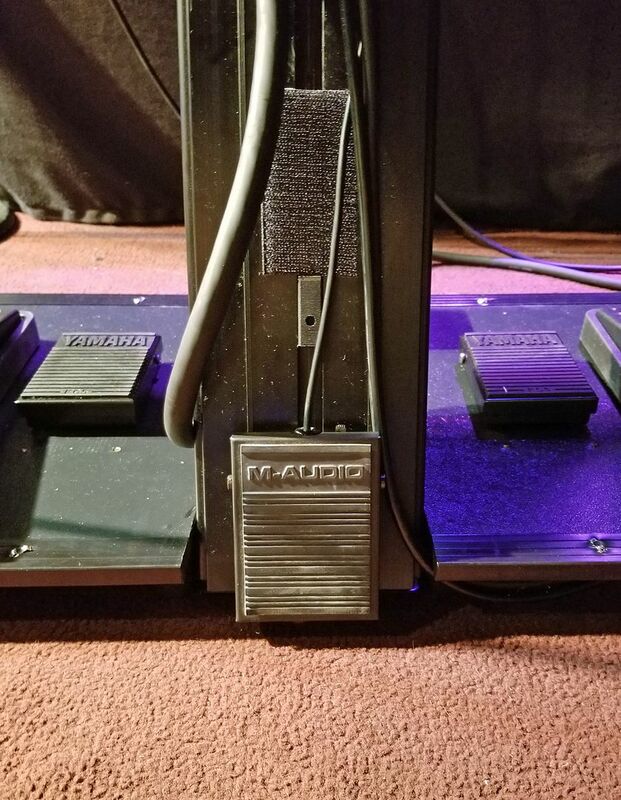 1.25" tall rubber feet were added to the underside of the pedal-board that both raise it above the three legs and lock it into position. It is very solid and does not structurally effect the stand during use. A junction box that handles the routing for all the cables was added and all pedal cables go under the board and up into the box. 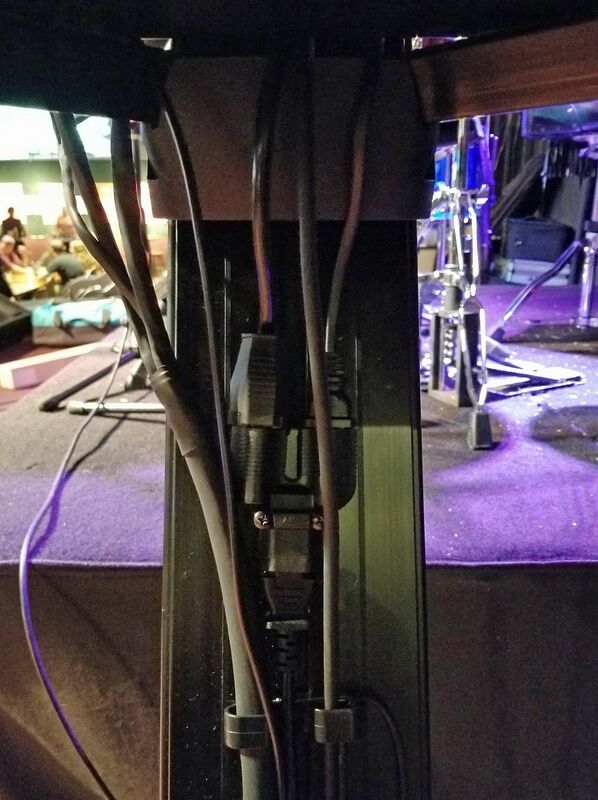 Two multi-pin connectors mate with snakes, one goes up to the various rear-panel jacks on the instruments, the other takes the midi and audio to the rack which has a matching multi-pin connector for the other end of that snake. A power cable splitter and a leslie slow/fast kick-switch were added to the flat side of the column. nice and clean looking set up! 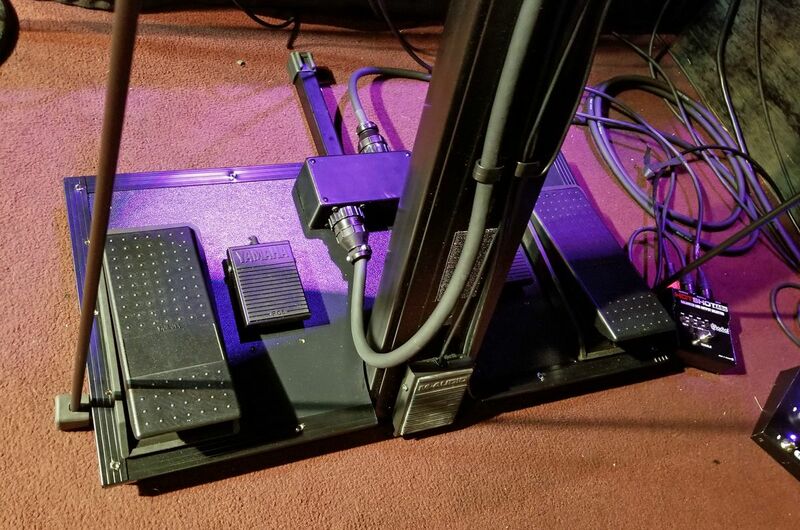 I've often wondered about having a pedal board that sits on top of the legs of an Apex stand to avoid that issue of pedal placement everyone talks about. That is slick. I have much to learn about simplicity, cleanliness, and consistency when it comes to my cables and pedals. It's this one, with the factory rubber feet and handles removed. Had to drill out the rivets to do that. I flipped it over and set the Apex in place then used a silver sharpie marker to trace the column cutout. Cut off the "carpet" material from the cutout area and used a jig-saw to cut out the marked area. I used Penn Elcom F1697 Rubber Feet to stand it off the Apex legs, but had to use 1" diameter flat washers to extend the height a bit. It was still interfering with the legs during use. If I were doing it again I would use the 9145's. I still may swap them out at some point. 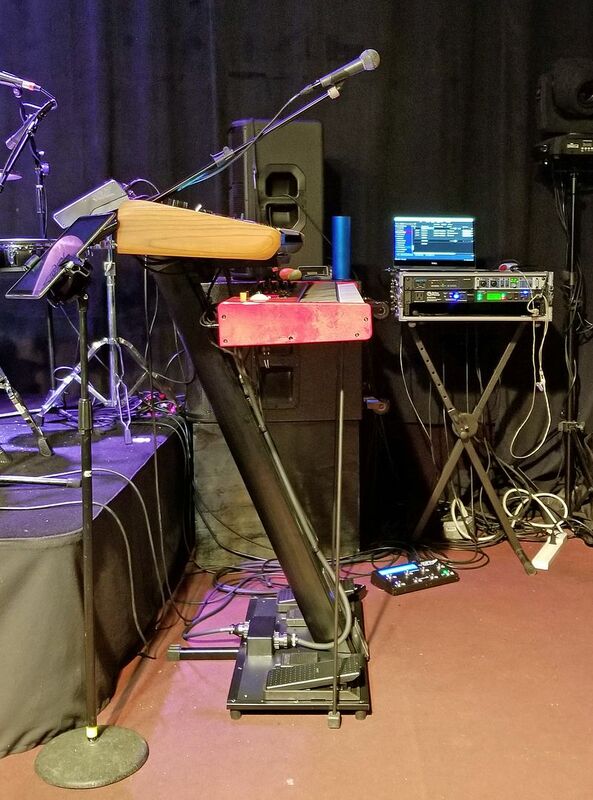 Note the two feet that straddle the rear leg and lock the pedal-board in place. You can't see it, but there's a chunk of 1inx2in pine at the "toe" end of the FC7 , so the whole board has a bit of a tilt to it. The front edge lies flat on the ground. The trailing jack you can see carries a line out to the stagebox on the tip, and a return from the desk on the ring to feed my in-ears. 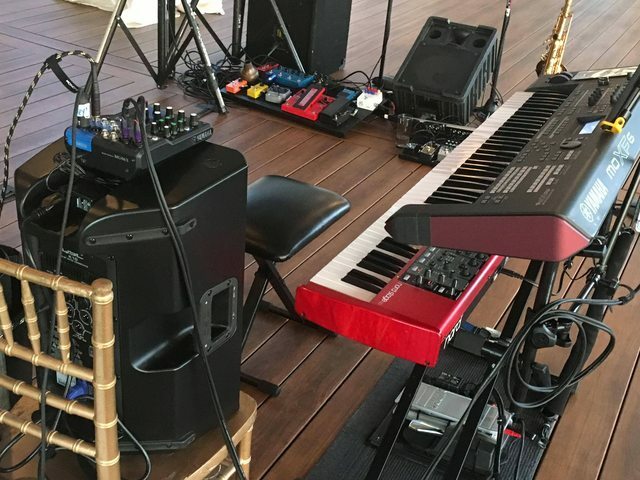 Here are some pics of my Top 40/Wedding/Corporate gig rig. 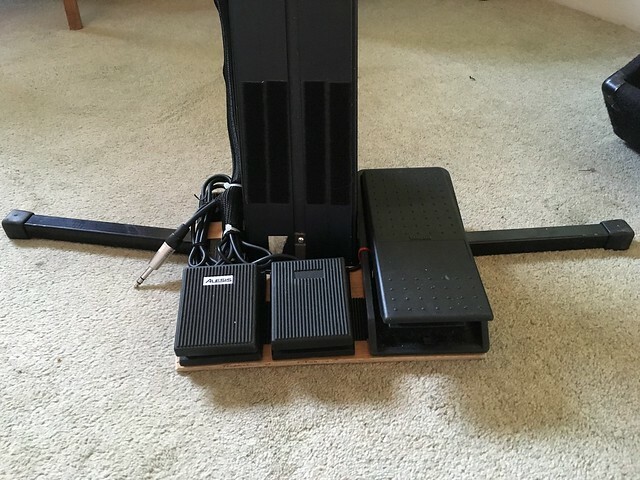 I made the pedal board and am using the XVP10 so I can send expression to both keyboards from one pedal. 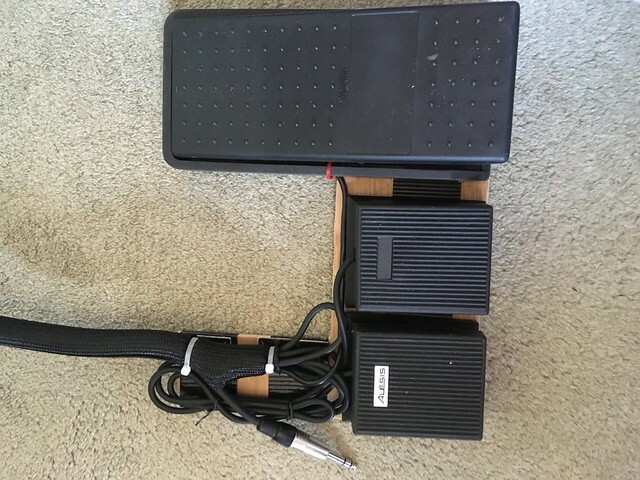 I recently started using the Yamaha MG06X and my solution to the annoying flimsy wall wart issue was to velcro the plug to my K10 and then run a separate 9 ft extension for it from the power strip alongside the QSC power cable. I run everything in mono (and edit patches accordingly) and use a TS cable from the mixer's Phones output for the QSC, and the sound guy takes one of the XLR outs from the mixer. This allows me to turn up the stage volume without affecting the signal to the board. The MOXF has a MUTEC 2 GB flashboard with some nice samples on it. Pretty slick, benj2017! I dig that you can use the expression with both boards, super useful... 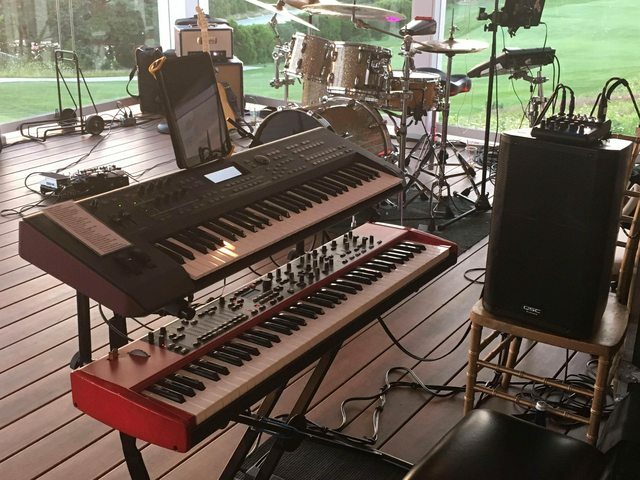 I use a Kurz SP6 and an Electro 3 for Top 40/wedding stuff. Welcome to the forum! Thanks! I prefer the longer throw/travel of the FC7, but I like having one pedal for both boards. With my midi routing it is easy to forget which voice in the split is coming from which keyboard. Many of the samples I used where my own (piano, brass, accordion, old-d50 stuff), so converted them into SFZ and am using Sforzando in Mainstage. others sounds from mainstage instruments and a few free soundfont files that I converted to SFZ. I prefer the stability and ease of sforzando to the mainstage sampler. 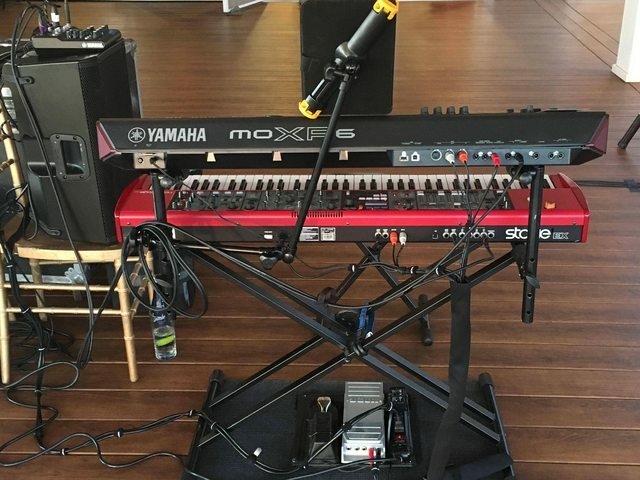 The DMC-122 is great: only 18KG and I like the short distance between the keyboards. I'm able to trigger everything from the DMC, not touching the Laptop (Macbook Pro 2012 with 256GB SSD and 16GB mem). Around 25% load. I use mainly aliases to keep the load low on CPU and memory. Also am using some tricks to use a separate control for both keyboards (mainly piano sounds on the bottom with optional pad/strings and al specific song splits and generatic sounds on the top). I do not use a patch for every song, but mainly select the right piano and top sound on the fly. I did backing tracks from my Forte-7, now using mainstage for this. I trigger 4 channels and use a cheap USB DAC for the click output. Headphone output for the sounds. Mix everything together with the Rolls PC351 and also use it's DI. Made a wooden backplate as i did not like the metal looks of the DMC. Seems very stable, pics are from it's first gig. Love the look of that DMC-122. You inched me a bit closer to pulling the trigger on the DMC+gemini combo. I also liked the duct taped table lamp on the DMC! Nice setup Erik! After shlepping 3 keyboards the last couple of gigs, I think I will try 2.
the plug key routed to the aux in on the piano. I was just thinking how good the Motif looks in three-quarter, and how well it o-ordinates with mirror shades, spiky do and goatee! lol I guess your right !!! Nice. You're not ever tempted to close that up so that you can reach all from your seat? Here's my latest, with the Kronos 88 and the 2 Nords. 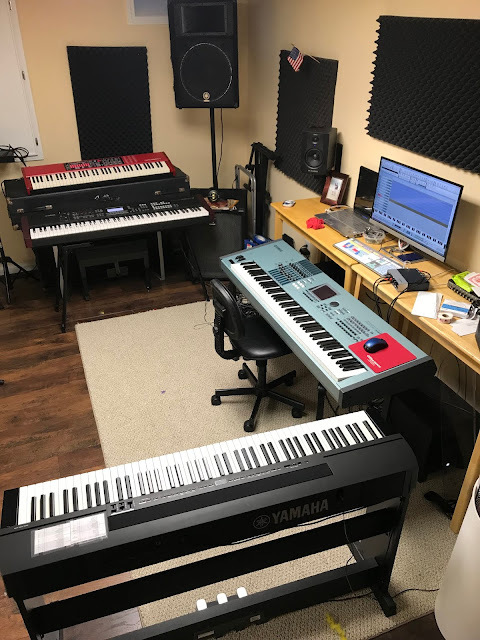 Here's my keys setup in the basement game room (shared with pool table on the left). My plan is to have a dedicated first floor room with natural light in my next (and last?) house.